TORONTO, ON, January 25, 2019 – Fundata Canada Inc. is pleased to announce the winners of the Fundata FundGrade A+ Award for 2018. 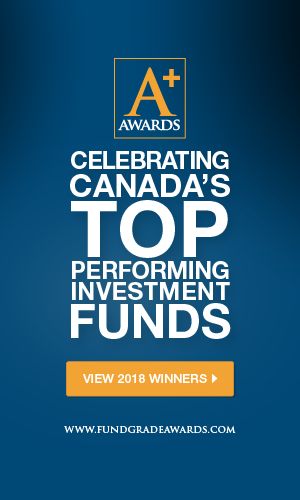 Awards were presented to 60 companies representing a total of 274 Canadian investment funds at Fundata’s annual “Evening of Excellence” held on Thursday, January 24, 2019, at The Globe and Mail Centre in Toronto. For more information and a complete list of the funds receiving the Fundata FundGrade A+ Rating for the calendar year 2018, please visit www.fundgradeawards.com.